Last night New York Sen. Kirsten Gillibrand become the third woman to officially enter the 2020 presidential race! Already, there are an equal number of women and men among the serious contenders who have announced they are vying for the 2020 Democratic nomination—something we’ve never seen before. Something else new? Multiple women among the frontrunners. Help get them on the Democratic debate stage by pledging $20 or more to Sen. Gillibrand and the other candidates on our Get Them on The Stage slate. Women are out front early because they know that will help them compete for the same attention and funding as male candidates, especially ones who might have higher name recognition and long-established networks. With the first Democratic debate only 5 months away, women simply can’t afford to wait. 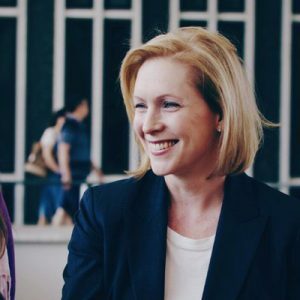 Sen. Gillibrand has built her career as a champion for women, from her sponsorship of paid family leave legislation to her leadership on stopping sexual harassment in the military, on campus and in Congress. She has also been a fierce advocate for women’s political participation through Off the Sidelines—which elevates women as voters, donors and candidates—and as a long-time booster of WomenCount. That’s why we’re proud to support Sen. Gillibrand and the other female frontrunners who will compete for our country’s highest office. Pledge $20 to her and other potential and declared candidates, and help Get Them on The Stage. We want all of the women candidates to be competitive in the early months of this historic presidential primary.